Unemployment in the Eurozone has reached a record high, increasing to 11.8 per cent in November, the EU's statistics office reports. Spain and Greece are suffering the most with roughly one in four workers unemployed. On Tuesday Eurostat released the detailed report about November’s unemployment figures along with data on the past 12 months. According to the report, some 2 million people throughout the Eurozone lost their jobs between November 2011 and November 2012. The total number of jobless workers reached 18.8 million. Spain and Greece top the list of countries with the highest unemployment rate, with 26.6 and 26.0 per cent (for September) respectively. The lowest rates were registered in Austria, Luxembourg, Germany and the Netherlands. The Latest figures also show that youth unemployment has risen from 24.4% from 23.9% a month ago. But while youth unemployment was at 8.1% in Germany and 9.7% in the Netherlands, in Spain and Greece it was 56.5% and 57.6% respectively. In total Eurostat reported that 18,820,000 people are now out of work in the euro area. 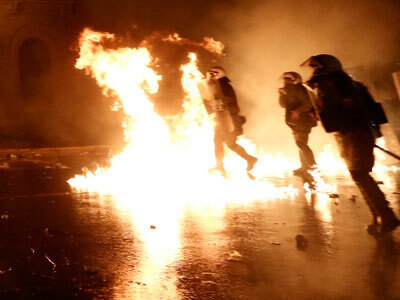 Both Spain and Greece have been rattled by massive, sometimes violent, protests and numerous strikes throughout 2012, as people vent their frustration to severe cuts and rising unemployment. The anti-austerity protests came to a climax on November 14th when millions of people took to the streets in 23 countries across Europe to mark the European Day of Action and Solidarity. Greece, which is balancing on the brink of default, has had to pass drastic austerity measures to qualify for its rescue package from Eurozone members, which have had a devastating impact on the lives of many Greeks. In mid-December, Eurozone finance ministers approved the release of another 34-billion-euro rescue package for struggling Greece. The decision was preceded by weeks of heated negotiations. As well as sky-high unemployment, salaries in the public sector and pensions have been slashed by almost 40% as Greece racks up austerity measures to qualify for EU bailouts. 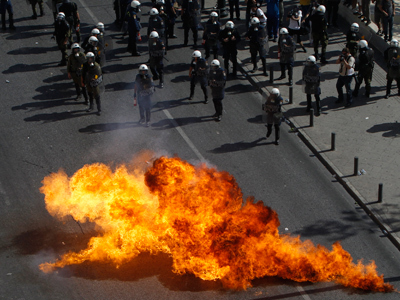 Greece has been the epicenter of many of the protests, with debt-laden Greeks staging massive general strikes. As people get poorer and tensions grow within Greece, far-right movements including the neo-Nazi Golden Dawn Party, have been on the rise. In April last year a Greek pensioner shot himself in-front of parliament apparently out of financial desperation. In a suicide note he said that he decided to take his own life so he wouldn’t have “to fish around in the garbage for my sustenance” and according to some witnesses who were nearby he shouted “so I won’t have to leave debts for my children” before turning the gun on himself. 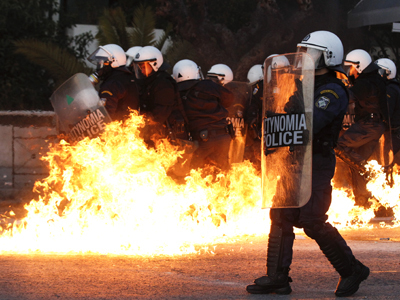 The total number of suicides in Greece has dramatically increased since the austerity program begun. Prior to the economic crisis, Greece had one of the lowest suicide rates in Europe at 2.8 for every 100,000 inhabitants. This figure has now almost doubled with 600 suicides in both 2010 and 2011 and the number of attempted suicides is also rising. 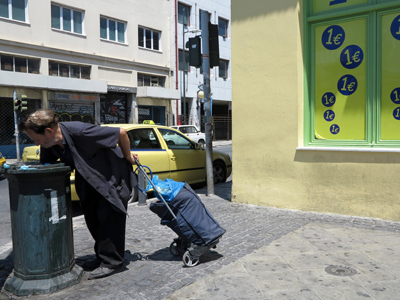 As queues form outside job centers and soup kitchens across the Eurozone the Greek Prime Minister Antonis Samaras told reporters in Berlin Tuesday that his country is meeting its pledges on economic reforms, “the glass is half full. We are delivering and Europe is helping,” he said. 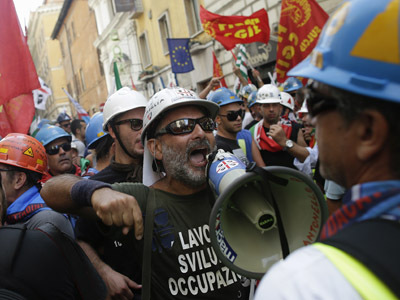 Italy has also seen protests at austerity and soaring unemployment. The latest figures show that the number of young people out of work in Italy is 37.1%, the highest since records began in 1992. In spring last year a 78-year old pensioner from Sicily threw herself off her third floor balcony after her pension was cut by 25% and she was reportedly unable to make ends meet. Another Italian, a picture frame maker from Rome, hung himself citing “overwhelming economic problems” while a further two men set themselves on fire in two separate incidents also citing money problems, although both survived, having sustained severe burns. Spain, the Eurozone’s fourth largest economy, also has the highest unemployment rate in the entire European Union, with Greece in second place followed by Portugal and Italy. It is estimated that more than 400,000 Spanish families have lost their homes since the beginning of the financial crisis in 2007 due to unpaid rent and mortgages. Since last autumn the Portuguese, too, have joined the swelling ranks of Europe’s discontent. The government stepped up austerity last September with more steep tax increases and public sector job cuts.For many in Portugal it was one step too far, driving tens of thousands into the streets in the largest protest of Portugal’s crisis.